Skin tags are benign growth that occurs on the epidermis of the individual. They hang from the skin, being attached to it by a thin piece of hanging skin, called a stalk. They are generally soft and skin colored. They tend to occur more on the eyelids, on the neck, under the arms and under the breasts. They can be removed by various methods. In the case of the extraction method, the growth is cut off or removed by surgical scissors of a scalpel. It is initially numbed with some sort of local anesthetic to reduce pain.This skin tag treatment leaves a fairly noticeable scar. The procedure itself is simple enough and is typically performed right in the physician's office. Suture is quite a primitive skin tag treatment by today's standard. It involves tying a surgical suture around the base of the growth. This cuts off the blood supply to the growth. In about three weeks, the growth typically falls off due to lack of blood flow. It is a bit less gruesome than the other methods but often leaves the base of the growth intact. This base is often called the root. Left in place, this root can grow a new skin tag or leave an unsightly bump. 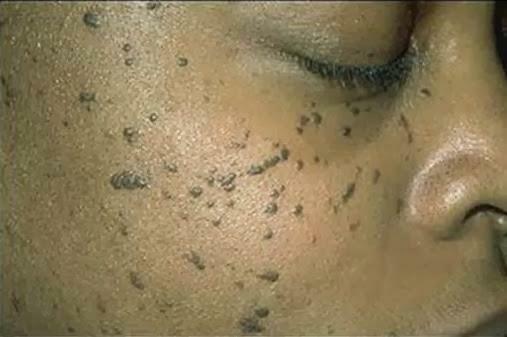 Some patients report this skin tag cure to be very painful. Before treating these type of growths by any surgical skin tag treatment, it is very important to be well informed about the disadvantages, advantages, side effects or any other complications that might occur. Be aware that not all surgical procedures are adequate for everyone.